In 100 Words: I have two kinds of conversations about When Harry Met Sally...: one where people ask, "Why is this on your Top 100 list?" and another where people, i.e., very nearly everyone, join me in effusing over its unflagging comic zing, its brightly bittersweet flavor, its persuasive portraiture of two specific personalities (and two zesty sidekicks) in a genre that favors what Sally would call "faceless" people. Does the latter make a strong enough case for the former? Edited perfectly for pace, comedy, and character precision, uncommonly well-played, totally onto its era and environment, no romantic comedy has touched it since. 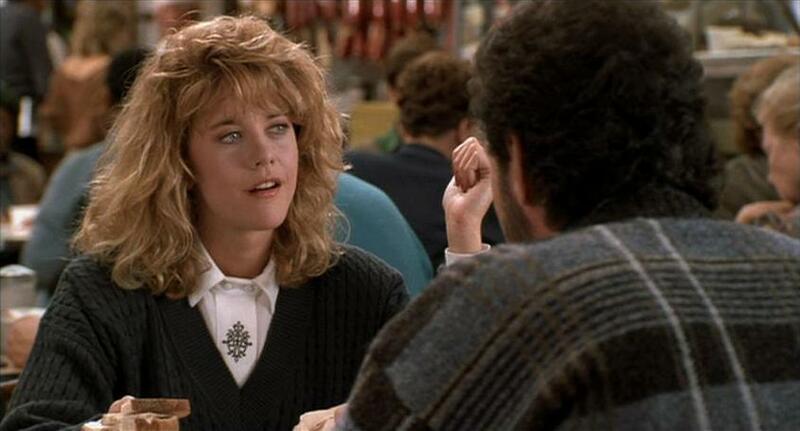 Food for Thought: Has anyone written anything great about When Harry Met Sally...? I can't think what it is, but I'd love to hear suggestions. Or, if you prefer, draw a rebus of the article you have in mind, in the medium of "Win, Lose, or Draw." (Exorcist baby! Yessir, that's my baby! No, sir, don't mean maybe!). Frank Krutnik positions the film alongside Annie Hall in his genealogy of the increasingly strained and self-reflexive genre of the late 20th-century romantic comedy. See his chapter "Love Lies: Romantic Fabrication in Contemporary Romantic Comedy" in the anthology Terms of Endearment: Hollywood Romantic Comedy of the 1980s and 1990s, edited by Peter William Evans (Edinburgh University Press, 1998). More recently, our beloved Guy Lodge offers some snappy aperçus about Harry as the starting-point for his essay "Queens of Hearts: In Defence of the Modern Rom Com," in Love: A BFI Compendium (London: BFI, 2015): 108-115.